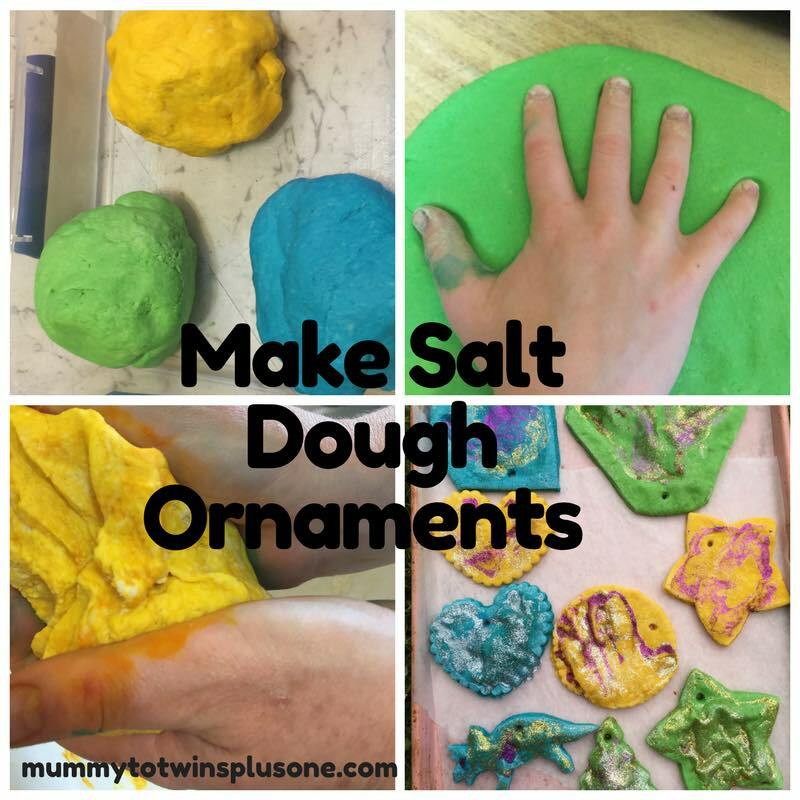 Salt Dough Ornaments are a perfect craft project to do with the kids. They are fun and you can make whatever your heart desires. Your imagination can run wild. 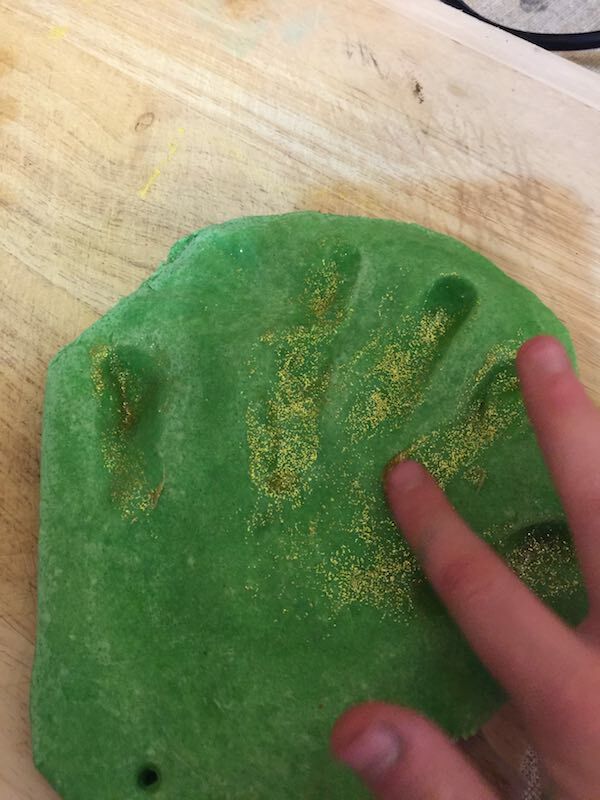 My kids wanted to create different animals and I made them do handprints as well. You can do feet prints if you wish. The kids will love to see their creations hanging from the tree, or on the doorknobs of cupboards and doors. You can make these decorations for any celebration. 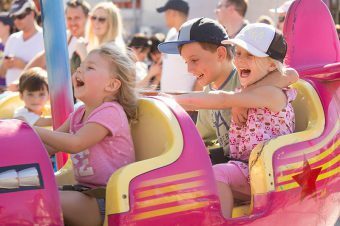 Easter, Birthdays and more! Paint if you wish to paint the ornaments rather than colour with food dye. Ribbon or string to thread through the ornament. Chopstick or another item to make the hole to hang the decoration on the tree. All my ingredients aside from the food dye to colour the dough. 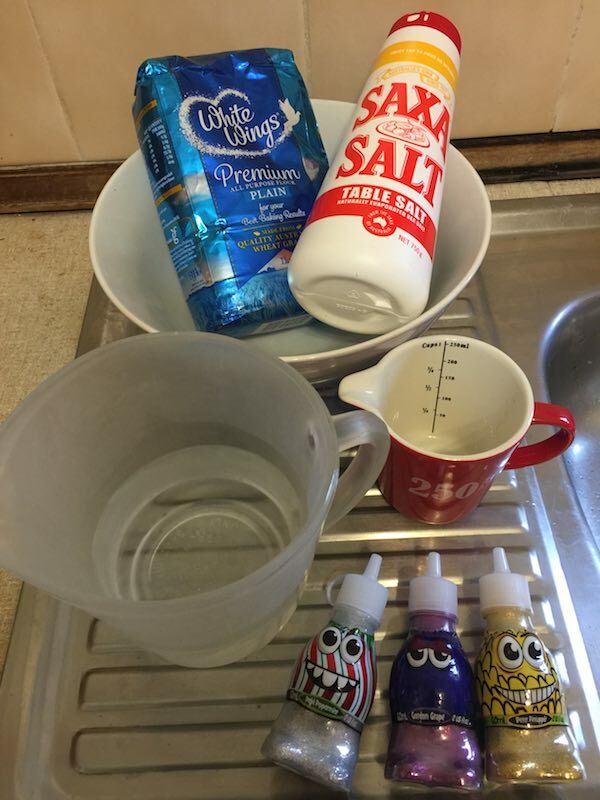 Add the food dye and mix some more to make sure that it is the right colour. I separated the dough into the three different batches. I made different colours for each child. This is a good way to ensure you know who’s decorations are whos. 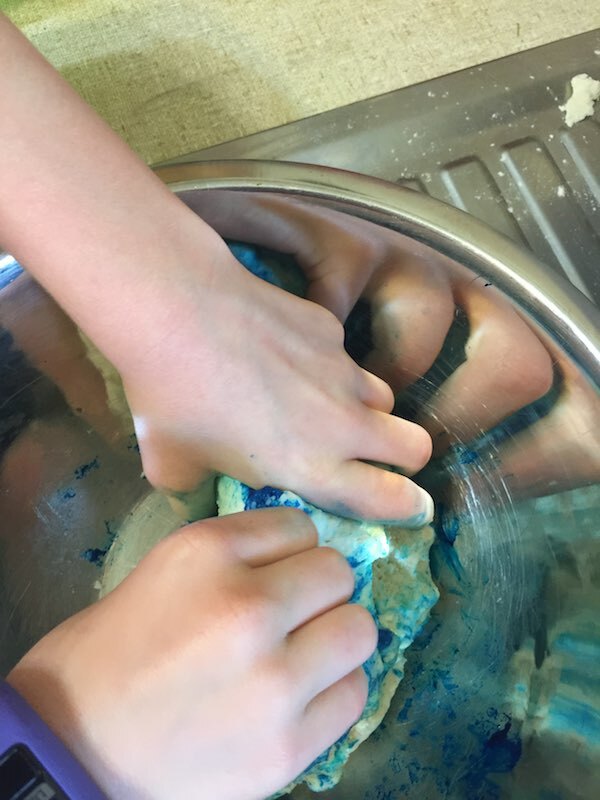 Julia mixing the blue dough. 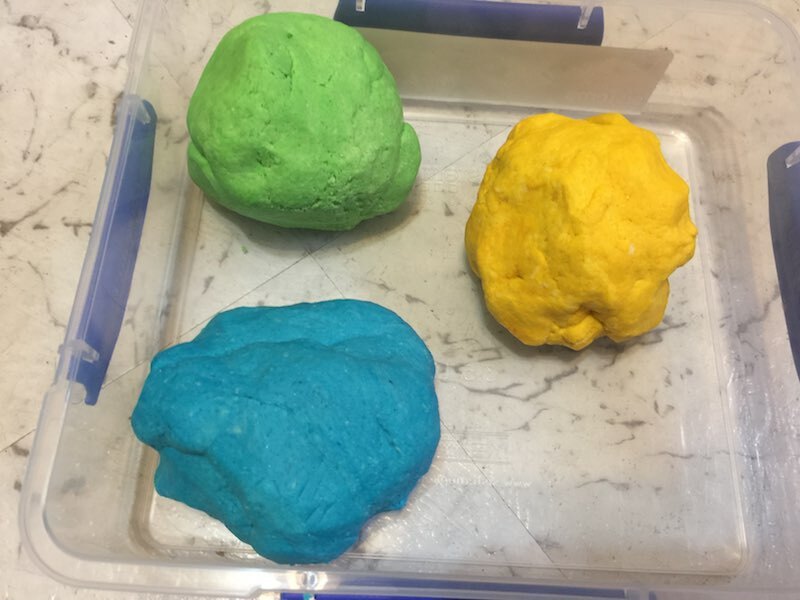 All three coloured salt dough. Cut out the shapes with the cookie cutters and then press handprints or feet prints on the decorations. 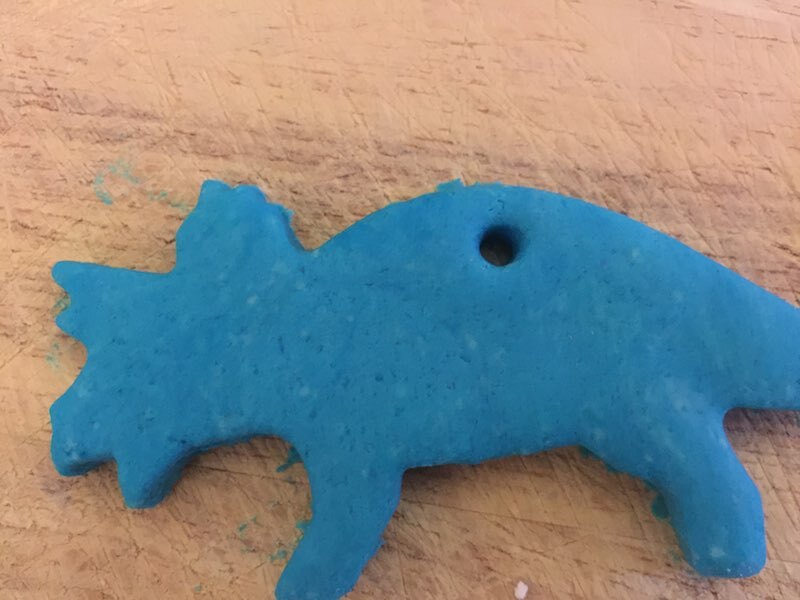 Adding the hole so you can hang your ornament. Make sure to do this before you bake the ornaments. Make sure to add a hole to put the string or ribbon into the decoration. Don’t forget to do this. Once dry it will be next to impossible to add the hole for the ribbon to tie onto the tree. We used the end of a chopstick. Put the decorations on a tray with baking paper and then bake in the oven. Bake in the oven for 1-2 hours at 100°C. or 200 °F. Time might vary depending on how thick the dough is for your decorations. If the ornaments are still doughy you can put them back into the oven, or maybe leave out to firm up before you decorate them. Once the ornaments are dry you can decorate them. The salt dough creature is ready to bake now. You can clearly see the hole that will allow you to put string/ribbon to allow you to hang up your decoration. Add ribbon or string to thread through the hole that you have added to the ornament to allow you to hang on the Christmas Tree or elsewhere. Decorating the Salt Dough Ornaments with Glitter Glue. 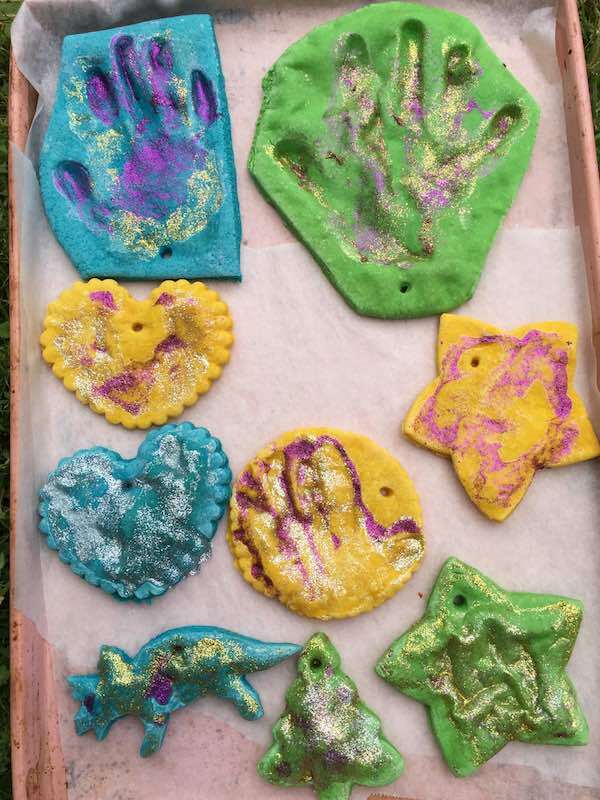 The finished Salt Dough Ornaments. Some are harder than others as they were not as thick as the others. The thicker ones need more time. If I was to do it again I would make them a bit thinner. 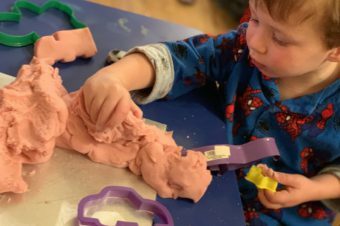 I hope this helps you create your own wonderful salt dough masterpieces. Stay current with all the things that are happening on Mummy to Twins Plus One? Don’t miss a thing by signing up to my newsletter. This newsletter will list all giveaways and fabulous things that are happening. 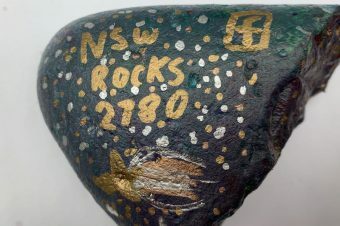 It is so lovely to add sparkling uniqueness and personality to arts/crafts; thanks for a wonderful article. 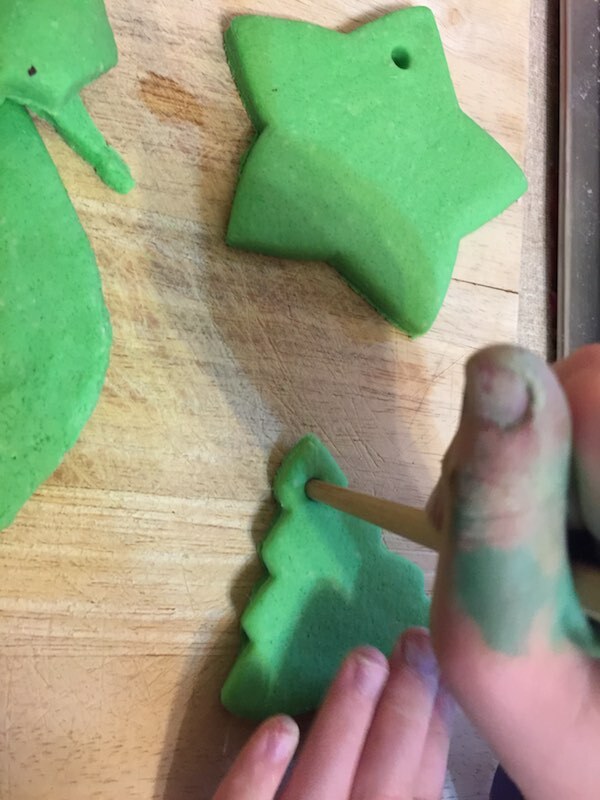 Glad you loved the tutorial to make salt dough ornaments. It is nice to add a personal decoration to the tree or even gift these special decorations to family.